Buy This Volvo - Cars! Cars! Cars! 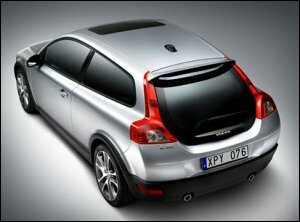 Edmunds reports: Volvo C30: Could be a 2008, could be a 2009. We aren't promising riches, fame, or booty, but this car sure is sweet. And it's exactly what other manufacturers should be striving for. Well, probably something with better gas mileage, too (we don't know what the C30 will have, but it won't be high enough), but you get the idea. A hot hatch that... actually, it'll probably be a tad towards the spendy side of things. Anyway, because it's a hatch, you'll be... you know, that hatch opening is sorta small. Not sure exactly what Volvo was thinking there. Can you even fit a body through that opening? Not that we'd be doing that. We're pretty sure Alison will willingly go into the passenger seat. Conscious. Otherwise there's the hatch. Should be bigger though. http://www.canadiandriver.com/news/060929-1.htm and I quote, "Production will begin at the end of 2006, with sales in Canada set to begin in early 2007. Prices have not yet been announced." kicking tires read the press release this morning that said it will be no earlier than a 2008 model. meaning it won't be out for awhile in the U.S. but there shouldn't be a reason it won't be a 2008.